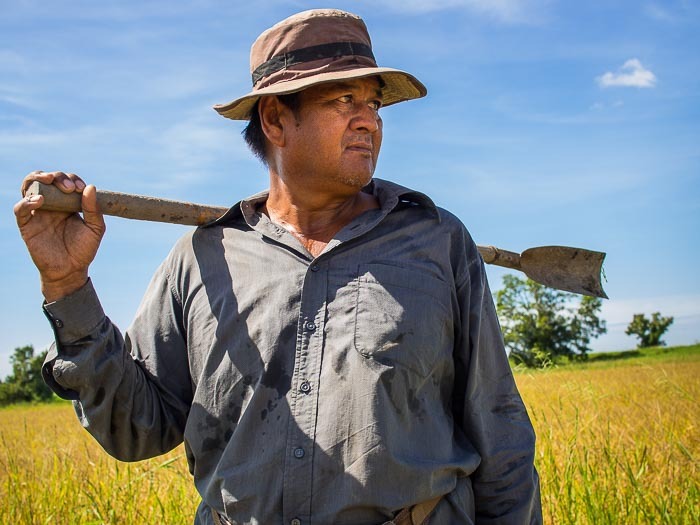 A rice farmer looks over his field near Ayutthaya while it was being harvested Monday. The rice harvest is underway in Thailand. 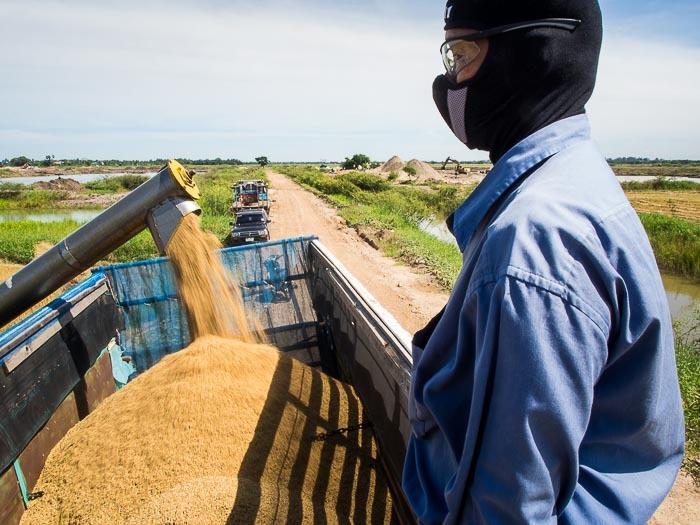 Thailand is the world's leading exporter of rice, although India and Vietnam threaten Thailand's supremacy, and rice is hugely important here, both as food and as an economic driver. When Thais ask if you've eaten, they actually ask if you've had rice yet. Rice, either as a grain (the way most Americans are used to eating it) or turned into noodles (Pad Thai) or a porridge (congee) is consumed at almost every meal. "Sticky" rice, also called glutinous rice, is used as a grain or starch for meals and cooked with coconut milk as a desert (sticky rice and mango or sticky rice and black beans). Rice does not have dietary gluten, so if you're on a gluten free diet you can eat rice. 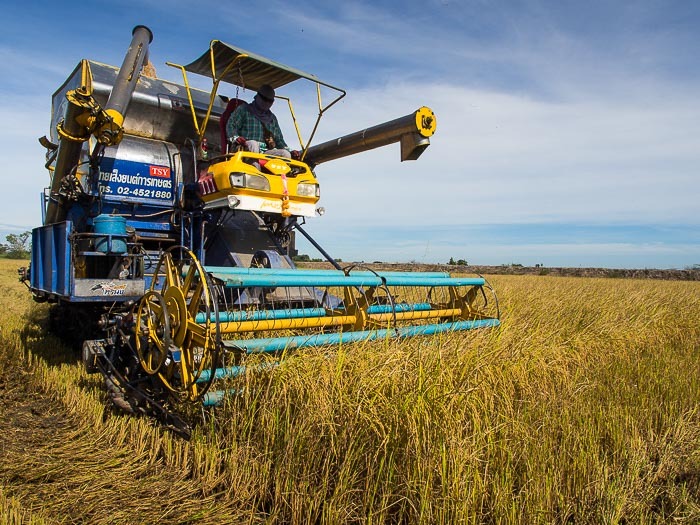 The rice harvest in central Thailand is mechanized, much like grain farming in the US. The rice harvest in central Thailand starts just as the rainy season is kicking into high gear. Every year, there's a race on to get the rice in before the fields flood. This year is no different. The Thai meteorological agency and flood mitigation agency have advised farmers to get their rice harvest in the next two weeks. Although it hasn't rained much in Bangkok, it has rained a lot up country. Rain has swollen the rivers upstream from Bangkok and officials said they may have to open floodgates on the Chao Phraya River and its tributaries to relieve flooding upcountry. Rice is loaded into a truck after it's harvested. When they do open the floodgates, it could trigger floods downstream especially in Ayutthaya and Ang Thong provinces, both of which flood almost every year. Farmers are busy bringing in their rice before the water comes. I made these pictures in Ayutthaya. There are more photos of the rice harvest in my archive or available from ZUMA Press.